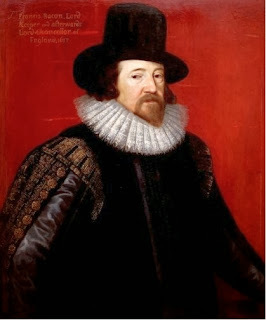 Francis Bacon. (1561–1626). Essays, Civil and Moral. Bacon pointed out that a judge's duty was to interpret laws and not to make laws. This single essay of Bacon's is a richly condensed summary of the ethics of law. JUDGES ought to remember that their office is jus dicere, and not jus dare; to interpret law, and not to make law, or give law. Else will it be like the authority claimed by the Church of Rome, which under pretext of exposition of Scripture doth not stick to add and alter; and to pronounce that which they do not find; and by show of antiquity to introduce novelty. Judges ought to be more learned than witty, more reverend than plausible, and more advised than confident. Above all things, integrity is their portion and proper virtue. Cursed(saith the law) is he that removeth the landmark. The mislayer of a mere-stone 1 is to blame. But it is the unjust judge that is the capital remover of landmarks, when he defineth amiss of lands and property. One soul sentence doth more hurt than many foul examples. For these do but corrupt the stream, the other corrupteth the fountain. So saith Solomon,Fons turbatus, et vena corrupta, est justus cadens in causa sua coram adversario [A righteous man falling down before the wicked is as a troubled fountain or a corrupt spring]. The office of judges may have reference unto the parties that sue, unto the advocates that plead, unto the clerks and ministers of justice underneath them, and to the sovereign or state above them. First, for the causes or parties that sue. There be (saith the Scripture) that turn judgment into wormwood; and surely there be also that turn it into vinegar; for injustice maketh it bitter, and delays make it sour. The principal duty of a judge is to suppress force and fraud; whereof force is the more pernicious when it is open, and fraud when it is close and disguised. Add thereto contentious suits, which ought to be spewed out, as the surfeit of courts. A judge ought to prepare his way to a just sentence, as God useth to prepare his way, by raising valleys and taking down hills: so when there appeareth on either side an high hand, violent prosecution, cunning advantages taken, combination, power, great counsel, then is the virtue of a judge seen, to make inequality equal; that he may plant his judgment as upon an even ground. Qui fortiter emungit, elicit sanguinem [Violent wringing makes the nose bleed]; and where the wine-press is hard wrought, it yields a harsh wine, that tastes of the grape-stone. Judges must beware of hard constructions and strained inferences; for there is no worse torture than the torture of laws. Specially in case of laws penal, they ought to have care that that which was meant for terror be not turned into rigor; and that they bring not upon the people that shower whereof the Scripture speaketh, Pluet super eos laqueos [He will rain snares upon them]; for penal laws pressed are a shower of snares upon the people. Therefore let penal laws, if they have been sleepers of long, or if they be grown unfit for the present time, be by wise judges confined in the execution:Judicis officium est, ut res, ita tempora rerum, etc. [A judge must have regard to the time as well as to the matter]. In causes of life and death, judges ought (as far as the law permitteth) in justice to remember mercy; and to cast a severe eye upon the example, but a merciful eye upon the person. Secondly, for the advocates and counsel that plead. Patience and gravity of hearing is an essential part of justice; and an overspeaking judge is no well-tuned cymbal. It is no grace to a judge first to find that which he might have heard in due time from the bar; or to show quickness of conceit in cutting off evidence or counsel too short; or to prevent information by questions, though pertinent. The parts of a judge in hearing are four: to direct the evidence; to moderate length, repetition, or impertinency of speech; to recapitulate, select, and collate the material points of that which hath been said; and to give the rule or sentence. Whatsoever is above these is too much; and proceedeth either of glory and willingness to speak, or of impatience to hear, or of shortness of memory, or of want of a staid and equal attention. It is a strange thing to see that the boldness of advocates should prevail with judges; whereas they should imitate God, in whose seat they sit; who represseth the presumptuous, and giveth grace to the modest. But it is more strange, that judges should have noted favorites; which cannot but cause multiplication of fees, and suspicion of by-ways. There is due from the judge to the advocate some commendation and gracing, where causes are well handled and fair pleaded; especially towards the side which obtaineth not; for that upholds in the client the reputation of his counsel, and beats down in him the conceit of his cause. There is likewise due to the public a civil reprehension of advocates, where there appeareth cunning counsel, gross neglect, slight information, indiscreet pressing, or an over-bold defence. And let not the counsel at the bar chop 2 with the judge, nor wind himself into the handling of the cause anew after the judge hath declared his sentence; but, on the other side, let not the judge meet the cause half way, nor give occasion for the party to say his counsel or proofs were not heard. Thirdly, for that that concerns clerks and ministers. The place of justice is an hallowed place; and therefore not only the bench, but the foot-pace 3 and precincts and purprise 4thereof, ought to be preserved without scandal and corruption. For certainly grapes (as the Scripture saith) will not be gathered of thorns or thistles; neither can justice yield her fruit with sweetness amongst the briars and brambles of catching and polling 5 clerks and ministers. The attendance of courts is subject to four bad instruments. First, certain persons that are sowers of suits; which make the court swell, and the country pine. The second sort is of those that engage courts in quarrels of jurisdiction, and are not truly amici curiæ, butparasiti curiæ [not friends but parasites of the court], in puffing a court up beyond her bounds, for their own scraps and advantage. The third sort is of those that may be accounted the left hands of courts; persons that are full of nimble and sinister tricks and shifts, whereby they pervert the plain and direct courses of courts, and bring justice into oblique lines and labyrinths. And the fourth is the poller and exacter of fees; which justifies the common resemblance of the courts of justice to the bush whereunto while the sheep flies for defence in weather, he is sure to lose part of his fleece. On the other side, an ancient clerk, skilful in precedents, wary in proceeding, and understanding in the business of the court, is an excellent finger of a court; and doth many times point the way to the judge himself. Fourthly, for that which may concern the sovereign and estate. Judges ought above all to remember the conclusion of the Roman Twelve Tables; Salus populi suprema lex [The supreme law of all is the weal of the people]; and to know that laws, except they be in order to that end, are but things captious, and oracles not well inspired. Therefore it is an happy thing in a state when kings and states do often consult with judges; and again when judges do often consult with the king and state: the one, when there is matter of law intervenient in business of state; the other, when there is some consideration of state intervenient in matter of law. For many times the things deduced 6 to judgment may be meum and tuum [mine and thine], when the reason 7 and consequence thereof may trench to 8 point of estate: I call matter of estate, not only the parts of sovereignty, but whatsoever introduceth any great alteration or dangerous precedent; or concerneth manifestly any great portion of people. And let no man weakly conceive that just laws and true policy have any antipathy; for they are like the spirits and sinews, that one moves with the other. Let judges also remember, that Solomon’s throne was supported by lions on both sides: let them be lions, but yet lions under the throne; being circumspect that they do not check or oppose any points of sovereignty. Let not judges also be ignorant of their own right, as to think there is not left to them, as a principal part of their office, a wise use and application of laws. For they may remember what the apostle saith of a greater law than theirs; Nos scimus quia lex bona est, modo quis ea utatur legitime [We know that the law is good, if a man use it lawfully]. Note 6. Brought into court.